张意奉(1992-), 女(汉族), 山西省朔州市人, 硕士研究生, 研究方向为土壤侵蚀。E-mail:244175652@qq.com. 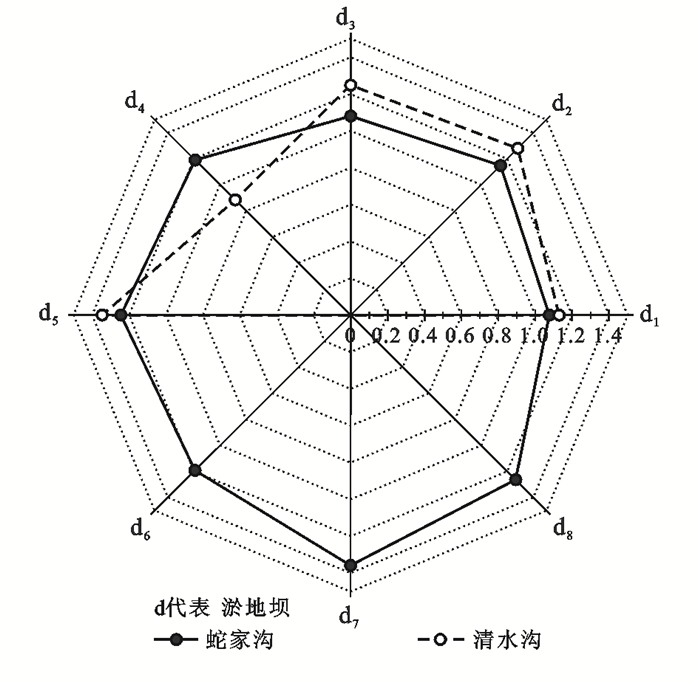 第一作者：张意奉(1992-), 女(汉族), 山西省朔州市人, 硕士研究生, 研究方向为土壤侵蚀。E-mail:244175652@qq.com. Abstract: [Objective] The sediment transport path, sediment connectivity and its influencing factors in the small watershed under the condition of extreme rainstorm of the reservoir were explored in order to explore the causes for dam failure and provide basis for the channel flood control. [Methods] Qingshuigou and Shejiagou small watersheds with similar areas and different shapes were selected to investigate the sedimentation in the channel after the rainstorm event occurred in Zizhou County, Shaanxi Province, on 26th July, 2017. The channel was divided into dam-gully section and natural gully section. The area and the shape coefficient of the watersheds, channel gradient and the type and distribution of check dams were used as factors to analyze the differences in sediment connectivity of the channels between the two small watersheds. [Results] Under the extreme rainstorm, all the check dams in Qingshuigou and Shejiagou were opened. The sediment connectivity showed a strong growth trend from the upstream to the downstream in Qingshuigou watershed, while it increased initially and then decreased in Shejiagou watershed. 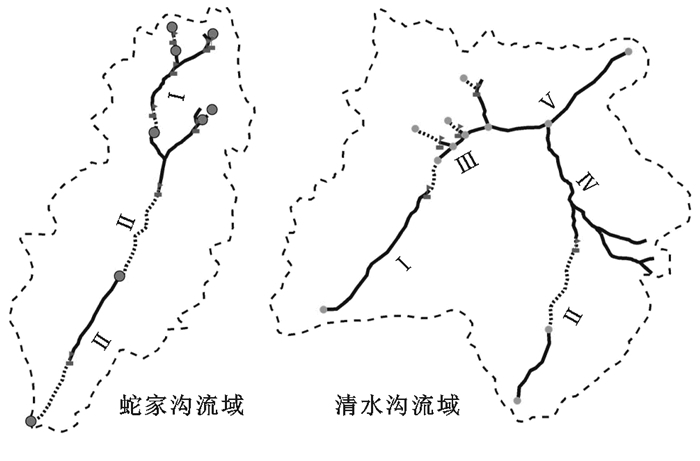 The sediment connectivity of the Qingshuigou watershed was stronger than that of Shejiagou watershed. Additionally, the soil erosion in Qingshuigou watershed was also more serious than that in Shejiagou watershed. Parallel dam system and hybrid dam systems, as well as check dams with horizontal tubes, shafts and drains showed better flood control capacity. [Conclusion] The area, the shape coefficient of watershed and channel gradient all affect the connectivity of channel sediment, while the type and distribution of check dams are the major factors. Wang Shuai, Fu Bojie, Piao Shilong, et al. Reduced sediment transport in the Yellow River due to anthropogenic changes[J]. Nature Geoscience, 2015, 9(1): 38-41. García-Ruiz J M, Beguería S, Lana-Renault N, et al. Ongoing and emerging questions in water erosion studies[J]. Land Degradation & Development, 2017, 28(1): 5-21. 史志华, 宋长青. 土壤水蚀过程研究回顾[J]. 水土保持学报, 2016, 30(5): 1-10. Bracken L J, Turnbull L, Wainwright J, et al. Sediment connectivity: A framework for understanding sediment transfer at multiple scales[J]. Earth Surface Processes & Landforms, 2015, 40(2): 177-188. Thompson C, Fryirs K, Croke J. The disconnected sediment conveyor belt: Patterns of longitudinal and lateral erosion and deposition during a catastrophic flood in the lockyer valley, South East Queensland, Australia[J]. River Research & Applications, 2016, 32(4): 540-551. Fryirs K A, Brierley G J, Preston N J, et al. Catchment-scale(dis)connectivity in sediment flux in the upper Hunter catchment, New South Wales, Australia[J]. Geomorphology, 2007, 84(3): 297-316. Bracken L J, Jacky C. The concept of hydrological connectivity and its contribution to understanding runoff-dominated geomorphic systems[J]. Hydrological Processes, 2007, 21(13): 1749-1763. Poeppl R E, Keesstra S D, Maroulis J. A conceptual connectivity framework for understanding geomorphic change in human-impacted fluvial systems[J]. Geomorphology, 2016, 277: 237-250. Baartman J E M, Masselink R, Keesstra S D, et al. Linking landscape morphological complexity and sediment connectivity[J]. Earth Surface Processes & Landforms, 2013, 38(12): 1457-1471. Heckmann T, Schwanghart W. Geomorphic coupling and sediment connectivity in an alpine catchment: Exploring sediment cascades using graph theory[J]. Geomorphology, 2013, 182(Supplement C): 89-103. Dalla F G, Lorenzo M. Slope-area relationships and sediment dynamics in two alpine streams[J]. Hydrological Processes, 2003, 17(1): 73-87. Vente J D, Poesen J, Verstraeten G, et al. Spatially distributed modelling of soil erosion and sediment yield at regional scales in Spain[J]. Global & Planetary Change, 2008, 60(3/4): 393-415. Aurore G, Olivier C, Vincent M, et al. Application of an index of sediment connectivity in a lowland area[J]. Journal of Soils & Sediments, 2016, 16(1): 280-293. Vigiak O, Beverly C, Roberts A, et al. Detecting changes in sediment sources in drought periods: The Latrobe River case study[J]. Environmental Modelling & Software, 2016, 85: 42-55. Masselink R, Keesstra S D, Temme A J A M, et al. Modelling discharge and sediment yield at catchment scale using connectivity components[J]. Land Degradation & Development, 2016, 27(4): 933-945. 刘宇. 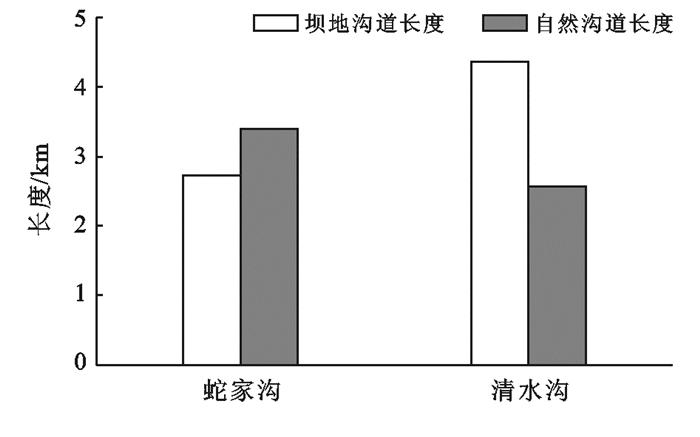 土壤侵蚀研究中的景观连通度:概念、作用及定量[J]. 地理研究, 2016, 35(1): 195-202. 王盛萍, 姚安坤, 赵小婵. 基于人工降雨模拟试验的坡面水文连通性[J]. 水科学进展, 2014, 25(4): 526-533. 景可. 黄土高原沟谷侵蚀研究[J]. 地理科学, 1986, 6(4): 340-347. Poesen J, Nachtergaele J, Verstraeten G, et al. Gully erosion and environmental change: importance and research needs[J]. Catena, 2003, 50(2/3/4): 91-133. 张金良, 刘继祥, 万占伟, 等. 黄河2017年第1号洪水雨洪泥沙特性分析[J]. 人民黄河, 2017, 39(12): 1-3, 7. 王楠, 陈一先, 白雷超, 等. 陕北子洲县"7·26"特大暴雨引发的小流域土壤侵蚀调查[J]. 水土保持通报, 2017, 37(4): 338-344. 魏军. 黄河2017年第1号洪水综述[J]. 人民黄河, 2017, 39(12): 1-3. 魏艳红, 王志杰, 何忠, 等. 延河流域2013年7月连续暴雨下淤地坝毁坏情况调查与评价[J]. 水土保持通报, 2015, 35(3): 250-255.